(ii) provide robust information to growers on optimising the economic potential of ground-durable eucalypts on their land. 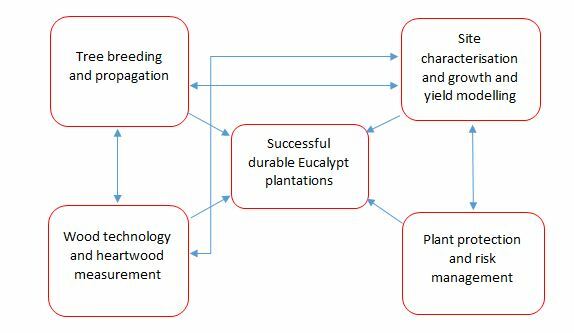 There is a need for product and market information, access to well-characterised superior genotypes, help with matching species to the right sites, predictions of forest growth and yield that include information about volumes of different products that might be grown on those sites, and reduced risk of failure due to clear guidelines for protection of crops from insects and diseases. We now have distinct research streams in these areas, but they are also linked. The New Zealand School of Forestry, University of Canterbury, is a foundation partner of the NZDFI. Staff at the School of Forestry form the core of the NZDFI Science Team. The Science Team leads the research undertaken by the NZDFI. In March 2017, the team produced a new series of research plans. An introduction to the overall research programme is available, as are the individual theme research plans. Murray's Nurseries (Woodville, Tararua) - hosting large-scale research plantings for wood quality testing. The over-riding aim of our research is to give growers all the resources they need to grow ground-durable eucalypt forests successfully.